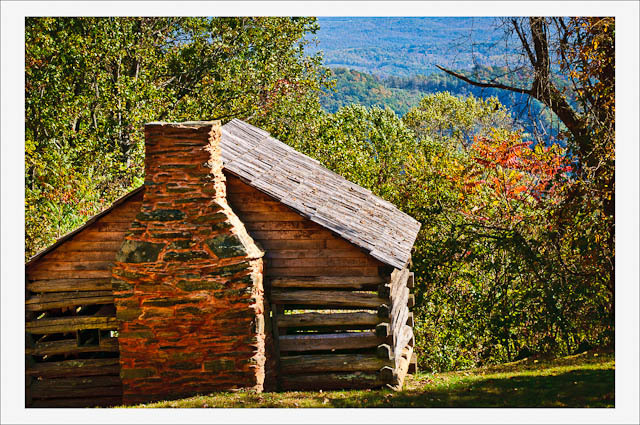 This old log cabin sits overlooking a portion of the eastern valley below the Blue Ridge Parkway at a popular overlook stopping point. The day I was there I was the only person present and that was nice…given the number of Fall 2010 visitors up there. It was once the home for one of many hearty folk who lived in this rugged part of the Appalachian chain. Most were forced to move when the parkway was constructed during the 1930s depression era, but remnants of their life remain here and there. This is but one example.